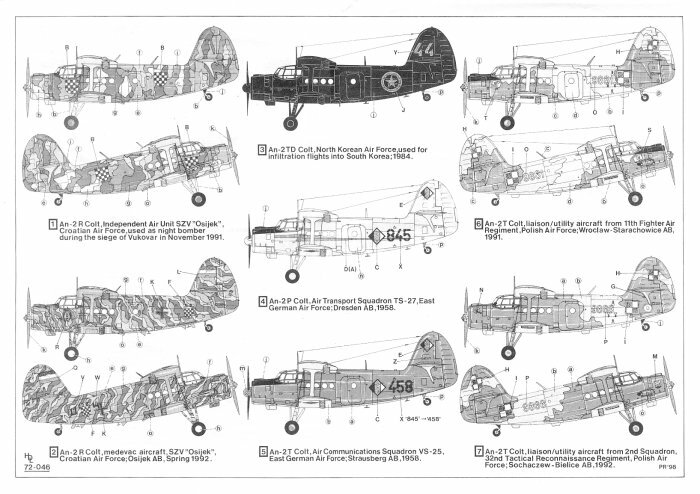 This sheet offers the modeller 7 decal options. 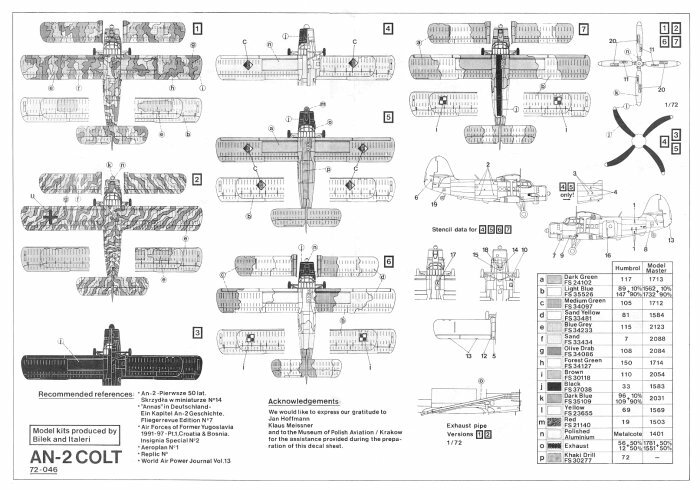 There are enough stencils included to do one of the 7 planes featured on this sheet, although with additional stencils about five planes could be made. The first decal option is for an An-2R Colt of the Independent Air Unit SZV "Osijek" of the Croatian Air Force which was used as a night bomber during the seige of Vukovar in November 1991. This plane has a very involved camo scheme including the following colours....Blue Grey (FS34233), Sand (FS33434), Olive Drab (FS34086) and Forest Green (FS34127) and Light Blue (FS 35526) for the underside. 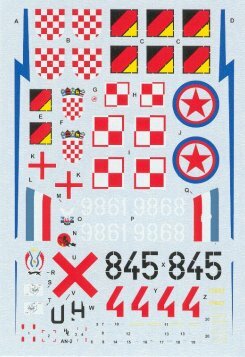 The second decal options is for an An-2R Colt medevac aircraft of the SZV "Osijek" of the Croatian Air Force out of Osijek AB in the spring of 1992. This plane has a very involved striped camo scheme including the following colours....Blue Grey (FS34233), Sand (FS33434) and Olive Drab (FS34086) and some Blue Grey (FS34233) for the underside. The markings on this aircraft include a Black Cat emblem on the left side by the cockpit forward side window. Also due to the medevac nature of this planes it includes decals of red crosses. The third decal option is for an An-2R Colt of the North Korean Air Force which was used night infiltration flights into South Korea in 1984. This plane has Black (FS 37038) everywhere on the exterior. The fourth decal option is for an An-2R Colt of the Air Transport Squadron TS-27 of the East German Air force out of Dresden AB in 1958. This plane has is polished Aluminium everywhere. The markings on this aircraft include a medium blue lightening bolt (in the form of decals included in the decal sheet) down both sides of the fuselage. The fifth decal option is for an An-2R Colt of the Air Communications Squadron VS-25 of the East German Air force out of Strausberg AB in 1958. This plane has is Dark Green (FS 24102) with everywhere with some black for the anti-glare on the topside of the engine cowl in front of the cockpit windscreen and Light Blue (FS 35526) for the underside. The sixth decal option is for An-2R Colt of the liaison/utility aircraft from the 11th Fighter Air Regiment of the Polish Air Force out of Wroclaw-Starachowice Air Base in 1991. This plane has a simple camo scheme including the following colours....Medium Green (FS34097) and Sand Yellow (FS 33481) with some black for the anti-glare on the topside of the engine cowl in front of the cockpit windscreen and Light Blue (FS 35526) for the underside. The markings on this aircraft include an Ace of Hearts playing card on the side by the cockpit forward side window.  The seventh decal option is for An-2R Colt of the liaison/utility aircraft from the 2nd Squadron of the 32nd Tactical Reconnaissance Regiment of the of the Polish Air Force out of Sochaczew-Bielice Air Base in 1992. This plane has a simple camo scheme including the following colours....Dark Green (FS24102) and Light Blue (FS 35526) and Light Blue (FS 35526) for the underside. The markings on this aircraft include a Goulish character riding a broom on the left side of the engine cowling and white eagle (?) emblem on the right side of the engine cowling. These decals are clearly printed in register and appear very thin, so they should conform beautifully. The smallest stencil writing is clear but not quite readable on the 1/72 sample I have before me....the smallest stencil text is very, very tiny.